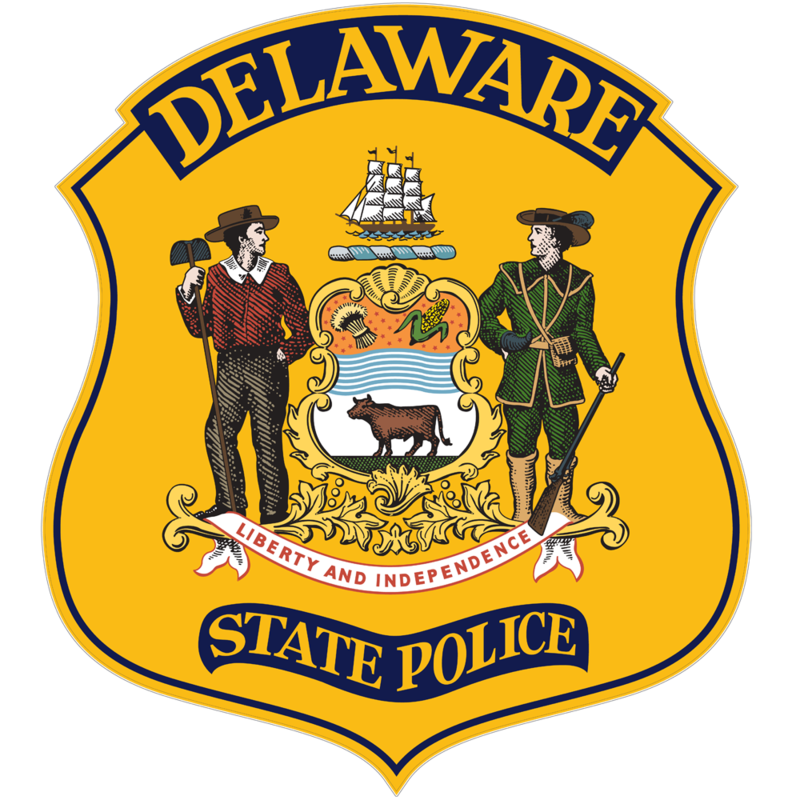 Millville, DE- The Delaware State Police are investigating a crash involving a dump truck carrying a load of dirt that occurred today. 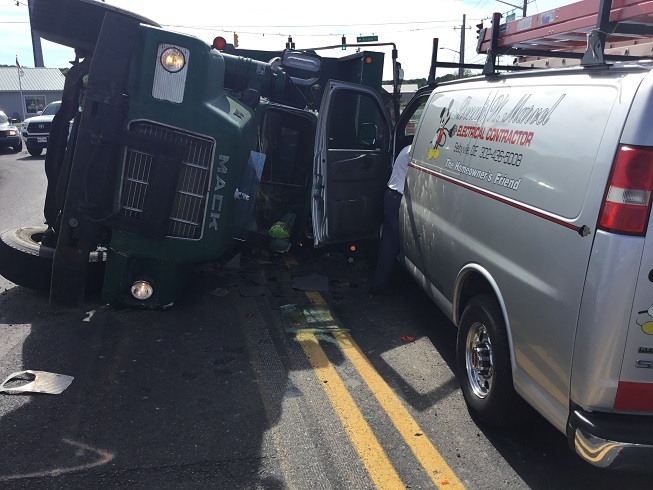 The incident occurred around 4:26 p.m. this afternoon on Monday, June 13, 2016 as a 1985 Mack Truck loaded with dirt, operated by Adam J. Prettyman, 28 of Georgetown, was traveling northbound on Roxana Road approaching a traffic-signal controlled intersection with Atlantic Avenue. A 2010 GMC van operated by Dennis Marvel, 60 of Selbyville, was in the left turn lane of westbound Atlantic Avenue and a 2005 Dodge Dakota, operated by Ryan G. Morgan, 40 of Dagsboro, was in the eastbound travel lane, both stopped for the red traffic-signal. In an attempt to make a right turn as the traffic signal was turning from “Yellow” to “Red”, the dump truck entered into the intersection at an unsafe speed at which time the load of the dump bed shifted to the left, subsequently causing the vehicle to overturn onto its side. As the dump truck overturned onto its left side, the top left of the dump bed landed on the GMC Van’s front. After impact, the dirt was thrown from the bed striking the Dodge Dakota driver’s side door. There were no injuries associated with this collision. EMS responded to the scene and no treatment was requested from any of the parties involved. 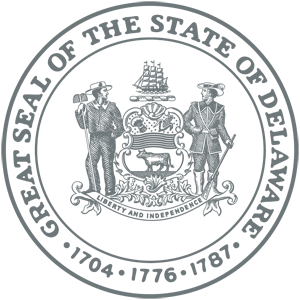 Adam J. Prettyman was cited with Careless Driving as a result of the collision. 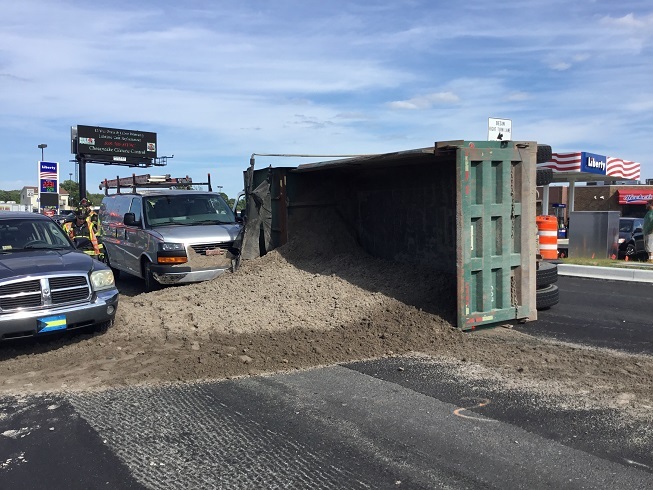 DELDOT responded to the scene in order to remove and haul away the dirt from the roadway as well as sweep the road. Atlantic Avenue was closed in both directions for approximately two hours while the collision was investigated. Traffic was re-routed by the fire police through the Hocker’s parking lot.